think you could make one for swamp lizards also? Im running red chinchompas right now. Its only placing 3 boxes instead of all 5. Is it supposed to do that?? EDIT: It got stuck between waiting and setting trap. 95. Doesnt it say in the paint?? If you want to borrow my account you can. You should make it hover over the next trap it is going to pickup while the character is in the middle of the picking up animation(if that makes sense). Restart the client, and run the script. See if it sets all 5 traps. Sorry for the long wait. 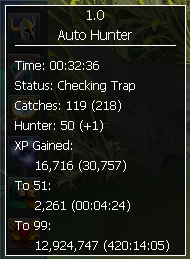 It only stopped using all 5 traps about 1h 20 mins in. It completely stopped at 1:32. Im retrying it now. 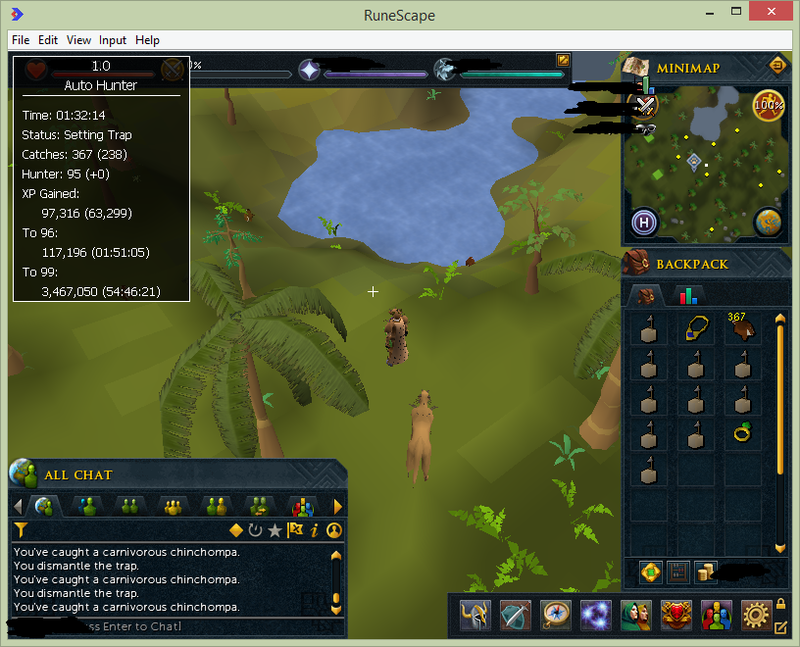 You should make it prioritize setting traps insead of prioritizing picking them up. Sorry for the long wait. It only stopped using all 5 traps about 1h 20 mins in. It completely stopped at 1:32. Im retrying it now. You probably lagged out and it lost track of some of your traps. Try going to a lower ping world. I would pay for a script that would do swamp lizards and banked them - using ROK (bank) and Canifis (return) lode-stone, beast of burden support, hint - hint! I haven't run into the same problem again. I cant run my PC overnight so I will do more testing in the morning. Once again, if you need a tester account I can give you mine(95 hunter). Coma use my proggy. You should also make the paint show what the user is hunting.